Peanut Butter and chocolate are my favorite combos to put in cookies. I had some leftover Peanut Butter cups and wanted to use them up, besides eating all of them:) Then I wanted to add some chocolate chips, can't beat more chocolate, and finally I added peanut butter. These cookies have double peanut butter, and double chocolate, Oh, my! We eat a lot of peanut butter in our house, about a jar a week of natural peanut butter, between the two of us. Scott has a whole wheat English muffin every morning topped with natural Peanut Butter and Gina's Jam, no excuses. I sent these cookies as part of a birthday package to my dear friend, Gina@SP Cookie Queen. Photo below courtesy of Gina's Facebook page, August 10th. One thing that I have found out is that it's not a good idea to bake with natural peanut butter, however, because the peanut butter never hardens, and it doesn't have any hydrogenated anything, only peanuts and salt. Ergo, your baked goods don't harden either. One year I made the the Hershey's Kisses Peanut Butter cookies, aka, Peanut Blossoms at Christmas, and they crumbled. I had a lot of peanut butter crumbs with Hershey's Kisses. Live and Learn, so If you make these incredible cookies, don't use natural peanut butter. Now when I bake anything with peanut butter, I have to use the unhealthy kind. One more tip for baking there beauties is to refrigerate the dough for several hours, and line the baking sheets with parchment paper, that way your cookies won't spread to much. I will be making these incredible cookies again for my PB and chocolate loving DIL soon:) Enjoy! 2. Line two rimmed baking sheets with parchment paper; set aside. 3. In a large bowl, combine the flour, salt, and baking soda, whisking until combined. Set aside. 4. In the bowl of your stand mixer fitted with the paddle attachment, cream the butter on medium high speed until smooth, about 1 minute. 5. Add the sugars and peanut butter, mixing until smooth, about 2-3 minutes. 6. Reduce the mixer speed and add the egg, vanilla, and milk, mixing until completely combined. Add in the dry ingredients, and mix until just combined. 8. Drop the cookie dough by rounded tablespoons or cookie dough scoop, onto the prepared baking sheets and bake the cookies until lightly golden around the edges, about 10 minutes. Let cool completely. ***At this point, I refrigerated the dough for two hours to prevent the cookies from spreading too much. they turned out perfectly. I'm sure that Doug and Dudette would love all the peanut butter and chocolate in these cookies. You'll have to make a few peanut butter cookies for you from the dough, before the chocolate is added. Is that why those cookies crumbled? I have tried natural peanut butter before, but since my daughter is the biggest consumer of it in the house and she likes the other stuff better I just buy the kind she likes. I think she didn't like the fact it separated. These were doubling delicious with the double peanut butter and chips. Thank you again for helping make my birthday an extra special day. I wish you lived closer so I could stop by all the time and see what is baking. Happy Hump Day! Love, love love Gina's Jam!! Actually, I had the nectarine version on my almond butter sandwich for lunch today. But your cookies... I saw the title flash by on my page, and with peanut butter + chocolate chip + pb cups my heart did a little leap. #awesomeness!!!! There is nothing better than Gina's jam. We are so spoiled, aren't we. Next time I make cookies, I'll make your oatmeal, peanut butter, PB cup cookies. I love oatmeal!!! Double Peanut Butter with Oatmeal, Amazing!. 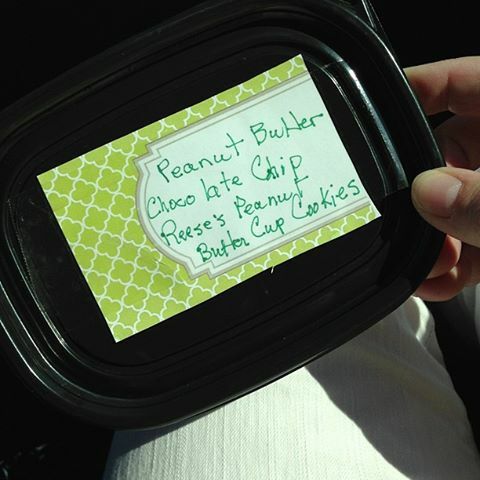 Love your wonderful addition of pb cups, so perfect! Natural PB is just peanuts that are ground into butter. Because there are no hydrogenated products in it, the oil separates from the peanuts, and you have to stir the PB, and then keep it in the fridge. It tasted just like fresh peanuts, no sugar either. Your cookies are fantastic and I wish I had one now, Becky! Interesting with the PB. Thanks for the recipe! These cookies are so good, full of peanut butter flavor and chocolate. Yum! Great tips, my friend, and I must agree that PB and chocolate are a classic combo (and one of my favorites too!) Thank you for sharing. These look delicious. These cookies are the perfect cookies for all peanut butter-chocolate lovers. Give Lucy a hug for me. If you love peanut butter and chocolate, you will love these cookies. They have so much peanut butter flavor, and chocolate.